Whatsapp Scheduler-Schedule Whatsapp Messages: Scheduling Whatsapp messages is one of the most needed technique these days. Whatsapp messenger is improving day-to-day and supporting more features like Whatsapp Voice call and Whatsapp video call, We may expect Scheduling Whatsapp messages soon in future. Over the internet, many are searching How to Schedule Whatsapp Messages, Whatsapp Scheduler, Whatsapp Scheduler Pro App. As Scheduling Messages plays the key role in avoiding the missing birthdays, upcoming functions, anniversaries etc.. Let’s wait for this feature get introduced onto WhatsApp. Meanwhile, I will provide the tricks How to schedule WhatsApp messages on WhatsApp using Whatsapp Scheduler Skedit App in this post. Scheduling feature is not yet introduced on Whatsapp messenger and it will never allow scheduling messages on it. However, this small trick which is will be given below will help you to schedule WhatsApp messages. There are many handy Android apps which Schedule Whatsapp messages on plays store. One can easily download them and use as Whatsapp Scheduler. For more Features on Whatsapp Download FM Whatsapp App. We have picked and listed the best app to Schedule WhatsApp messages. There is no requirement of rooting your android mobile as these apps are directly available from google play store. The SKEDit Scheduling App is the app which can schedule your Whatsapp Messages. SKEDit is a free and easy-to-use scheduling app that lets you schedule WhatsApp messages, schedule SMS, send emails later, schedule posts, and set call reminders. This top-rated Android scheduling app puts your communication on autopilot, the free 5-in-1 Whatsapp scheduler, SMS scheduler, Facebook Post scheduler, Call scheduler, and Email Scheduler is a handy app for scheduling your tasks. Save Time: Schedule WhatsApp messages, SMS, and emails to be sent later automatically. Save countless hours lost in tedious back-and-forth messaging each day. Eliminate Stress: Streamline all your communication so it runs smoothly. Calmly breeze through your day not worrying about sending message reminders or last-minute phone calls. Stay Organized: Structure, schedule & plan all your communication down to a T. No more drowning in an ocean of unwelcomed phone calls, emails, and messages. Boost Productivity: All your communication needs to be handled. Tackle your top priorities with laser-like focus with a fully-free WhatsApp, post, and SMS scheduler. Automate Your Communication: Swift, automated communication makes everything fall into place like clockwork. Relax as you sail through your day, having already planned it yesterday. Set Reminders: Schedule WhatsApp messages, automatic emails, and call reminders to be sent to yourself. Enjoy effortlessly staying in-sync with your plans through the power of automated reminders. Register: Get Registered using one click facebook signup. Choose Communication Service: Select the communication method you’d like to automate: Call, SMS, Email, Facebook, Whatsapp. Write Content: Write down your message or content you’d like to have automatically sent. Important Note: For successful scheduling of your messages, One needs to disable screen lock to work, a technical requirement that is outside skedit control. 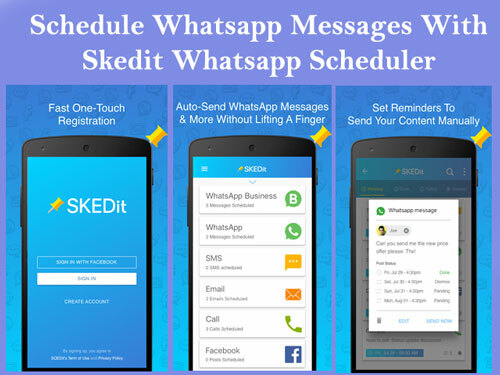 With Skedit Scheduling App one can easily schedule WhatsApp messages, Schedule SMS, Schedule automatic emails, Schedule posts on facebook with the posts scheduler, Schedule blogger posts. Do share your reviews about Skedit Whatsapp Scheduler app by commenting. How to Remove Shortcut Virus from Laptop, PC, Desktop (Windows 10/7/8), USB, Flash Cards, Pendrive, Harddisk Permanently Without Losing Data.